Awesomesaucebeachhouse I is set in the Mission Beach district of San Diego 2.8 km from SeaWorld San Diego and 6 km from Old Town San Diego State Historic Park. The accommodation is 6 km from the University of San Diego and features free WiFi. This holiday home has a terrace a living room and a flat-screen TV. A dishwasher an oven and a microwave can be found in the kitchen. Downtown San Diego is 11 km from the holiday home while Balboa Park is 11 km away. 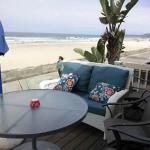 The nearest airport is San Diego International Airport 7 km from the property.